Looks good! That should make a heck of a difference. I agree, it should help. Kinda wish they had a vent for the rear near the windshield in the center. Couple companies make a large center mounted vent, poison spyder comes to mind but I didn't care for the look myself. 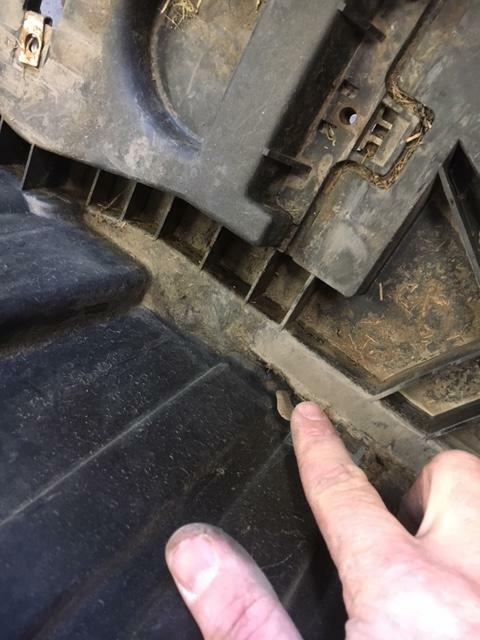 I have read some people pull the rear hood seal out to allow air to escap but junk can fall down in there then. So my next job is to address some electrical. I have a dual battery kit to install and then some additional lighting. I've held off on the rear tire mount as I am finishing up the hydro install on my hossfeld bender. 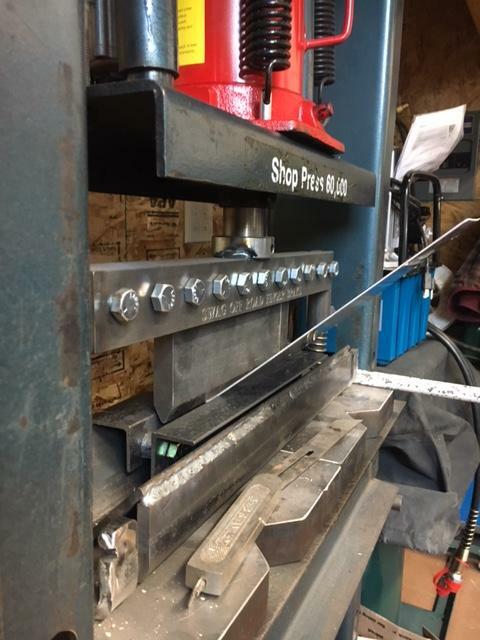 Had an old pieced together setup and I am improving on it and then adding a better hydraulic system (read I'm spending good money to do it sort of right, not hossfelds design but pretty close). Thanks guys, it seems to move some heat. Was 50 - 60 here yesterday & you could definitely feel the heat coming up through the side vents after driving it. Ok, so on to my not so favorite subject. Electrical, with the plan to add more components that work off of invisible fire we needed to install a dual battery setup. The first component of that is a dual battery tray. I selected one from M.O.R.E. or mountain off road enterprises. Since I am sure there are pictures of the stock engine bay on this thread we will bypass that. 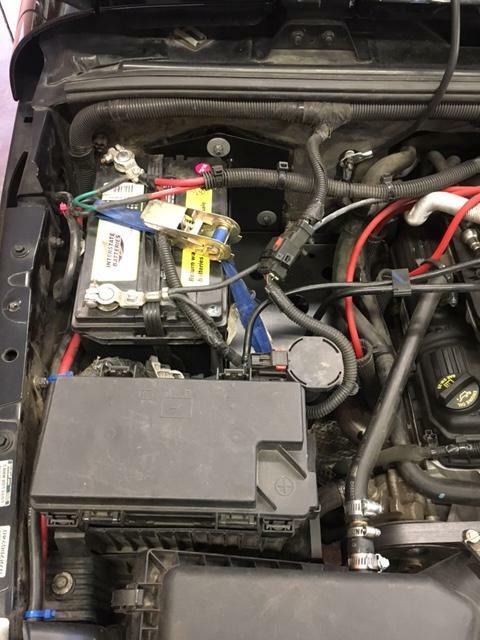 The first step is to remove the battery & air box then to disconnect the ECM and remove it. 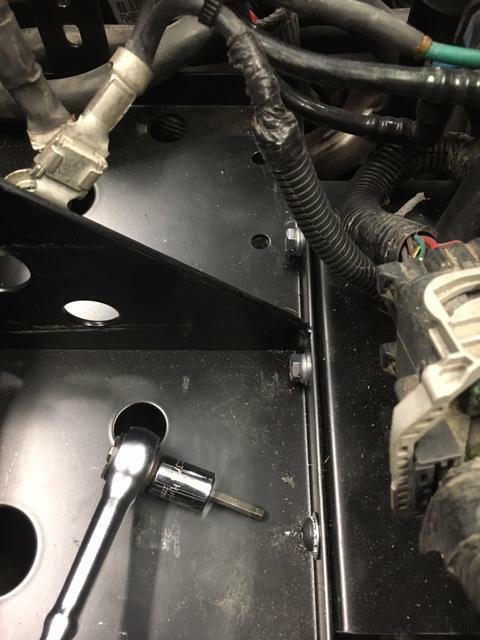 Also unbolt the power steering reservoir mount and lay it to the side. then remove the stock battery box which starts at the fire wall and extends to the core support. 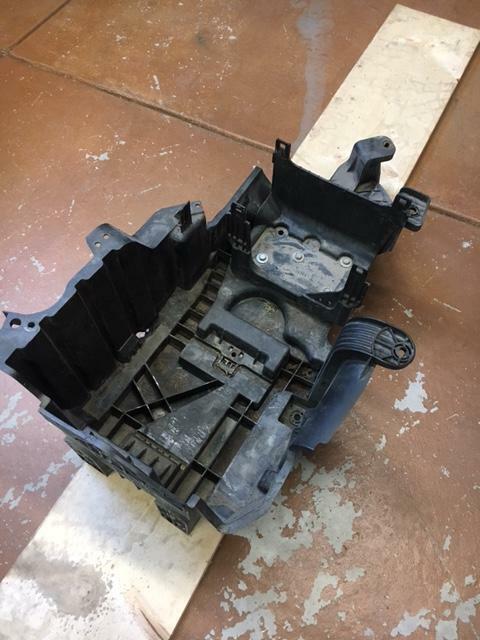 remove the ECM mount from the battery box and save for later. 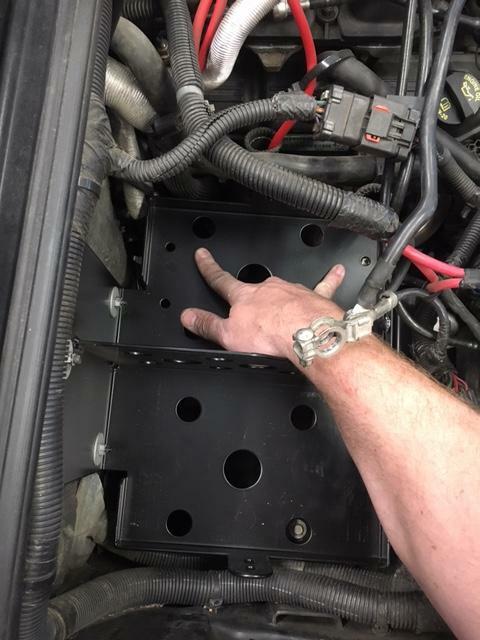 The tray is two pieces and in the center running vertical you can see three bolts, they are a pain. Not to mention after I finally get them in the interstate battery is just shy of fitting. So we went to the hardware and I swapped them out for a setup that was just shy of an 1/8" in height. This gave just enough room for that battery to fit like a bug in a rug. Several things I am not happy about with this kit, first the inner battery sits partially over the passengers side header. 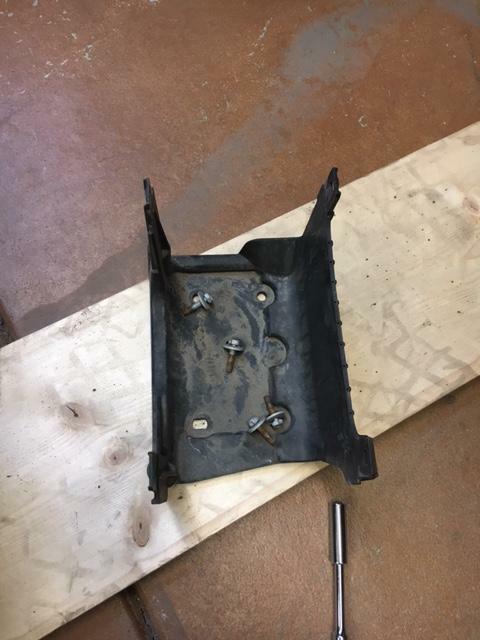 Even though MORE does not show a heat shield someone either made one or thought there would be a need for one as the inner tray has a 4 pattern set of bolt holes in this tray. 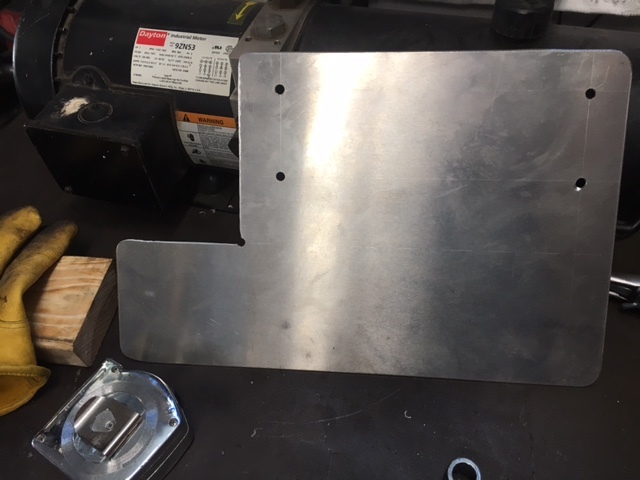 I will be fabbing up a heat shield to mount from them out of Aluminum. Next up on my list is this upper firewall mounting bolt. There are three of them but only the upper one sticks out far enough to contact the battery. So using a set of bolt cutters I trimmed it back a half inch and then with a soft pad rounded the end. It no longer touched the battery. So last of my complaints, they spend all this time making a battery tray that fits nice and they give me this for an upper hold down for two batteries? Oh and the hold down J bolts aren't long enough which doesn't matter because this flimsy piece of 1/8" isn't going across the top of my batteries. Great progress. I like the hood vents. Question- if the headers melted the original battery tray wont that ratchet strap be toast....er...melted synthetic fabric pdq? Looks tight in there. Is that the Airbox up front and the batteries sit side/side now and you just have a single in there? Correct, I put it back together enough to drive around block and park in the back bay of my garage. Second battery sits motor side of battery that is there currently. 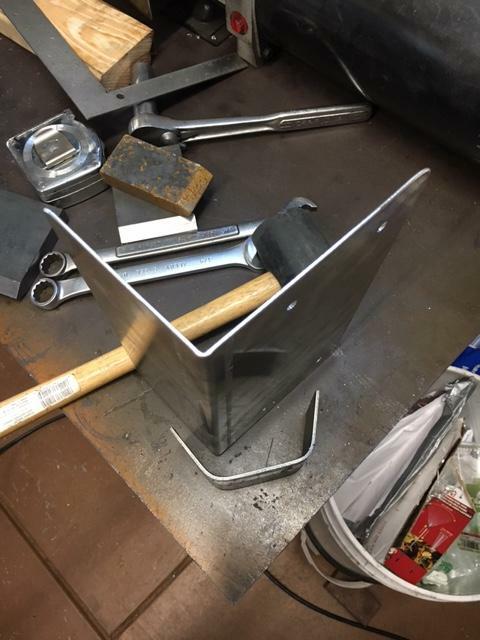 I am going to build the "heat shield and get it mounted and then finish up with a new mo better hold down plate. Honestly the batteries are really snug with the new hardware but want to get it so that they won't tip side to side in a roll over. Ratchet strap is made of unobtanium, we're GTG! Don, there are several companies who make a kit. One uses optima batteries and they mount them in their side. I'm not that cool, nor do I want to be. I wanted to run Costco interstate batteries. Not saying their is anything wrong with optimas as I have run them in the past. However, I think they are a little overrated for this build. My guess is by the time you get to working on GJ you'll have better options as several companies are currently working on new mo better versions. Shawn, forgive my ignorance, but what about a gas engine rates having two batteries? Being able to start it is always a good idea. So what we're thinking here is that we will add two batteries & isolate one from the other. The first battery runs the jeep starter etc. The second will run the winch, auxiliary lights, fridge etc. 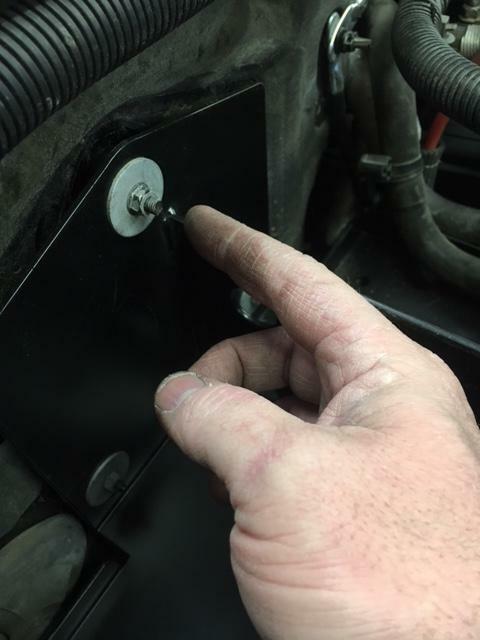 If we're making long pulls with the winch let's say & wear that battery down we still have a topped off fresh battery to start the Jeep & get us home at the end of a long day or weekend of camping. Yesterday I ran into a time crunch putting the ecm and battery back in place. In my hurry I left off the ground from the battery to the inner fender well. 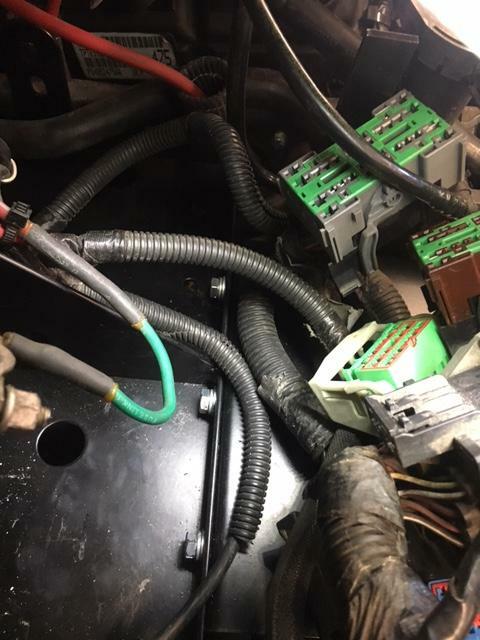 In my defense I forgot that two grounds went to that stud (one from the ecm wiring and one from the battery) and the one from the battery was buried under the other ecm wiring. So it was running a little rough at first last night and the starter didin't seem to be engaging full on as it was intermittent. At that point I was in a rush and it was a bit of a blur. So I parked it in it's place and headed out, kinda thinking last night that I probably knocked a plug wire loose pulling the stock battery tray. Well, as it was I woke up thinking about that ground not a plug wire this morning. Somebody helped me out I think during the night. Sure enough I go out and look to see a ground hidden under the ecm. I pulled the ecm loose from the mounts and wiggled the lost ground out from under that mess of wiring. I reinstalled it and jumped in the Jeep, it fired right up and ran great. However, there was an engine light on and figuring it was bogus from my snafu I decided to reset it by unhooking the battery. So I did that and a half hour later hooked the positive cable back up and jumped in the jeep to start it up. A whole lotta nothing is what happened next. Plenty of lights etc all over the dash working properly, door chime kicing off but no starter not even a click. WTH I thought and started looking over all the connections. After checking the battery etc I thought well maybe somehow I toasted the solenoid on the starter? I mean everything works except that dumb starter and this is the second one in 4-5 months. 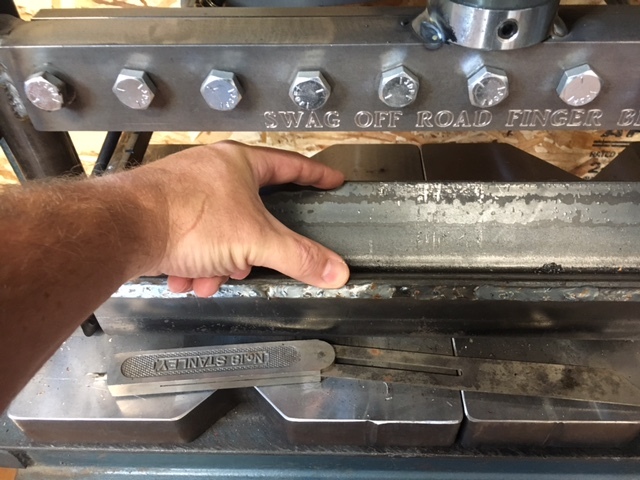 After a bit I decided well pulling the starter isn't hard and the Napa down the street has that fancy machine that can test these out six ways to Sunday. So off it came and in the middle of that my phone rang five times while I'm stuck on a creeper under the Jeep. 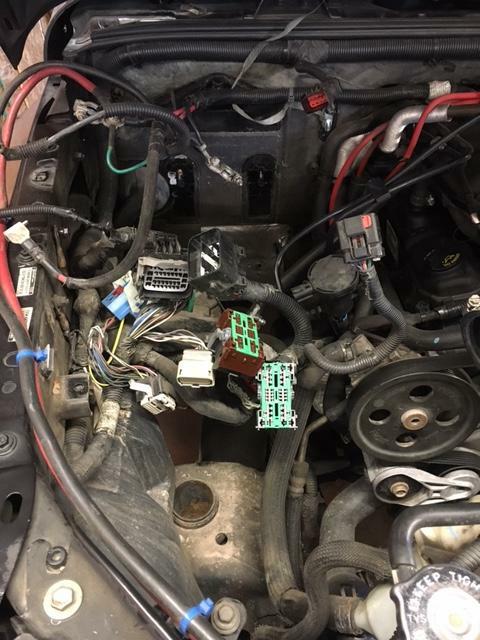 I then noticed after pulling off the heat shield that the solenoid wire is not attached. Well, maybe I pulled it off in the confusion of that pesky phone ringing? At this point I almost put it all back together but thought I'm this far and might as well get it checked out. Why not it's only one more wire and it will be out already. So I did and it tested like a new one, which it should because it's pretty new. So go home and reinstall it and it was fixed, but the darn engine light is still on and it's gunna stay that way for now. That thing probably has about 20 codes in it from the ground issue. Wouldn't worry too much. HF has em all the time, they work great! I agree with Ken, not worried about the codes. It runs like it did before so it's just annoying at this point. Mine was the best $100 (or thereabouts) I ever spent. Has paid itself many times over. And they're cheaper now. Definitely get one. You'll be happy you did. Mine is about 10 years old from HF. Just used on my wifes 2013 Captiva. Showed a bad cam soleniod, was a $50 ten minute fix. Well, you done playing around and get back on the jeep projects?? Negative, trips to Indiana every 3 weeks are killing me. Plus I've been doing concrete, landscaping and fencing today trying to get ready for planting our growing garden areas. I keep moving the box of aluminum sheet around to do the heat guard under the new dual battery tray. Hoping maybe in the next couple days get it cut and formed up. So the trips to Indiana are over with at the present time. I say that knowing that in the not to distant future I will have to go back having a Dad who is 80 and diagnosed with CHF. His time here is short and he is ready to go. On to the heat shield and that darned piece of aluminum I keep moving out of my way. 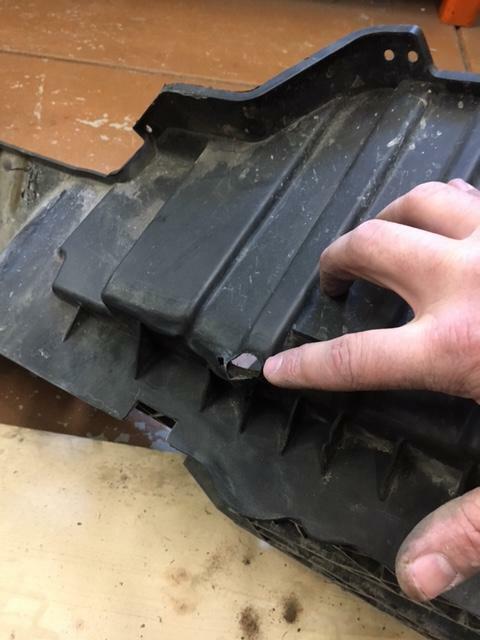 When I was installing the dual battery tray I took some careful measurements knowing a heat shield would be needed with the battery tray located over the passenger header. I can't be cooking $100 batteries all the time. I started by laying out the template for the tray I had sketched up earlier. Air nibbler, drill and grinder with soft pad knocked that out quick. 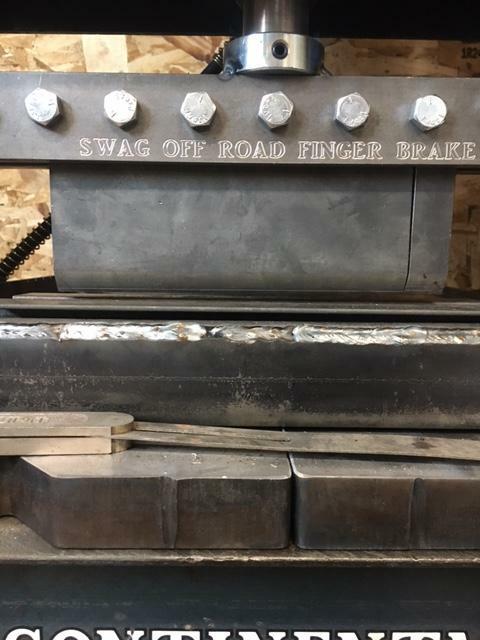 The next thing was to address the bottom die in the shop press. 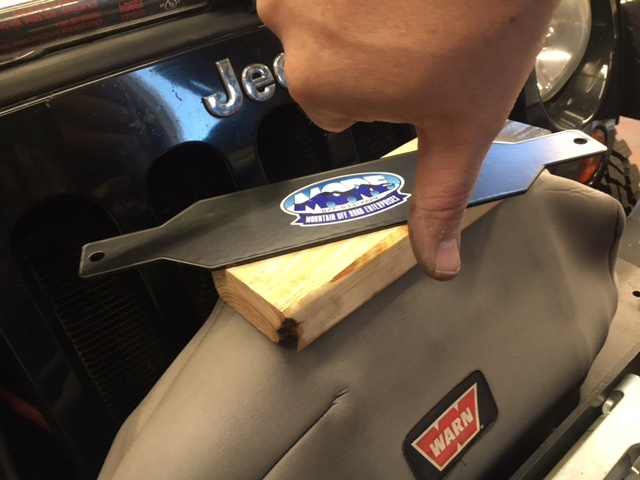 At 3.5" wide it makes a huge bend in material and that will eat up real estate I do not have in the jeep bay. After a little bit of scrounging in the drop rack I found a quick solution. Couple quick cuts on the band saw and drilled a couple of holes and we were in business. 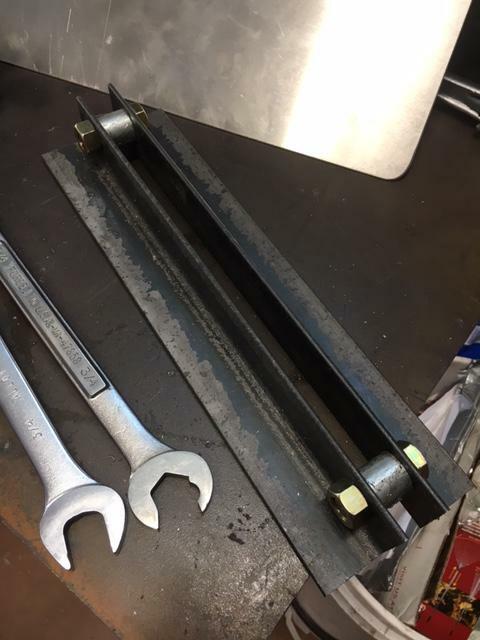 I did run into one snafu, the legs on these bends are 4" and after bending the first tab it wouldn't clear to let me bend the second longer length leg. So I pulled out my largest hand shears and trimmed it down to about an 1 1/4". You can see the modification by comparing these two pictures. Took this picture to detail a couple of points. First I think I will acquire some silver solder and try my hand at filling that gap, may already have some just need to do some digging. 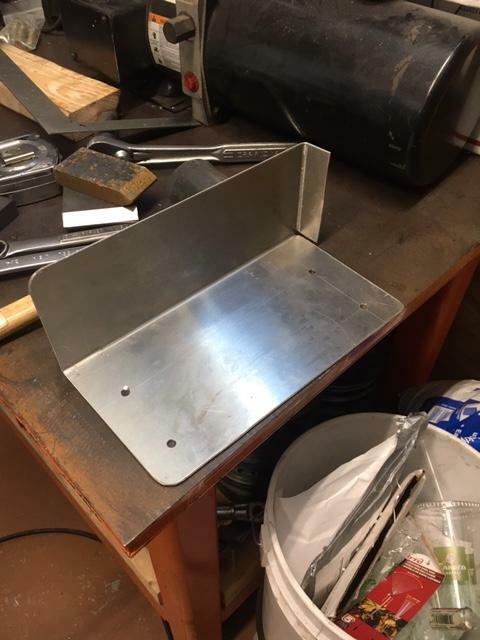 The other point I would like to make is that relief hole I drilled in the corner of the pan, you can se it here and how removing that material on the pattern gave way to allow the pan to form up in the corners unobstructed. Makes for a cleaner job I think. Now on to the install at a later date as I have a fence job for the older neighbor lady to complete. Here is a shot of the two different bend radius. 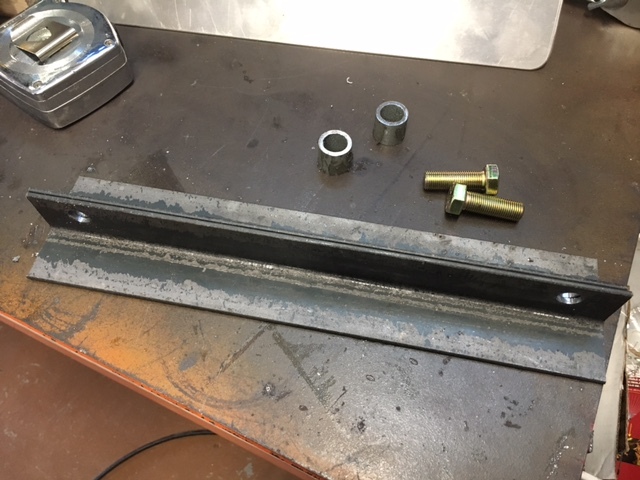 The lower is the stock 3.5" and then the upper is the 13/16" opening die I made. Both of these essentially air bend the material meaning the dies are not meant to bottom out. 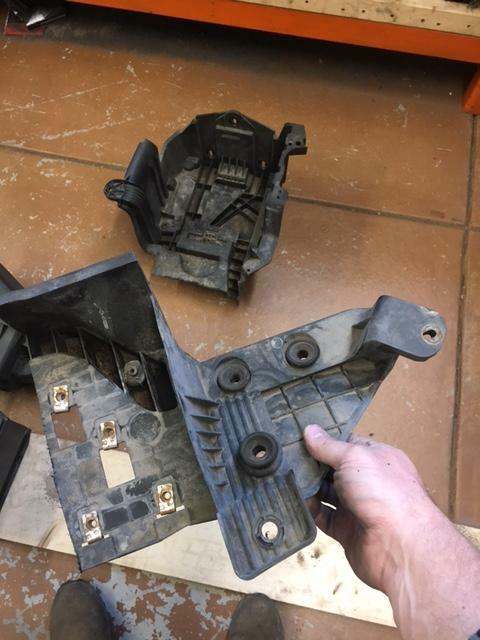 TRN, the place is swagoffroad.com I bought their press plates too as my press didn't come with any and these are a great upgrade over stock cast HF units that can explode. 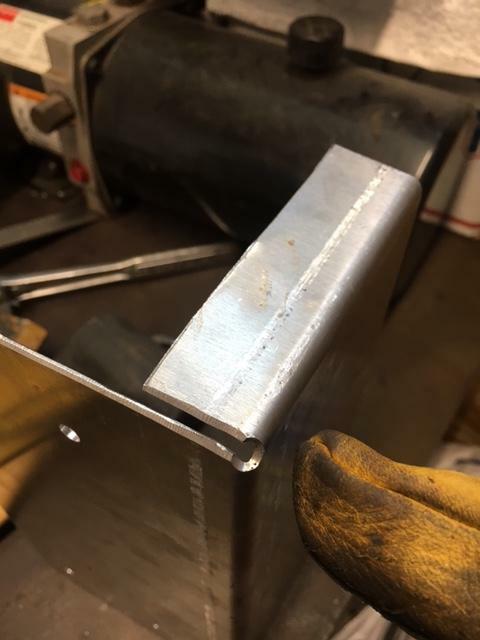 Hard to se in this picture but after inserting the angle iron bottom die I had approximately a 1/4" of space to slide the 1/8" material in to form it. Didn't know you were a MMB... Master Metal Bender... Picked up all kinds of tricks in IN didn't ya! 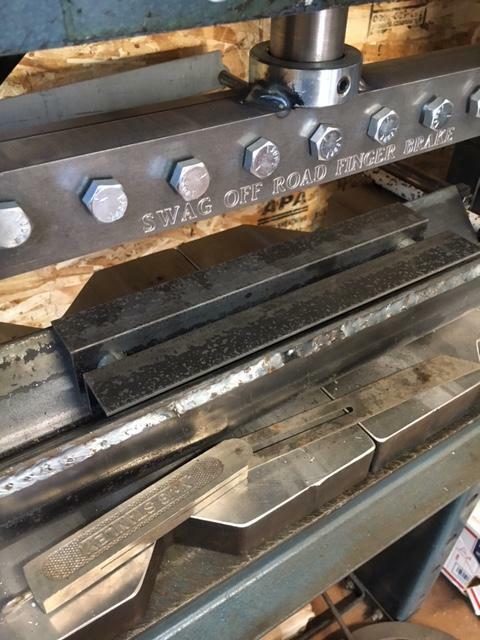 Back in Indiana we had presses and tooling worth a couple mil, here in my garage we have the tooling made from scrap! Just got the hf 20 ton and thinking about the press. So it's been awhile since I wrenched on this. A long while, other priorities have taken up much needed time this year. 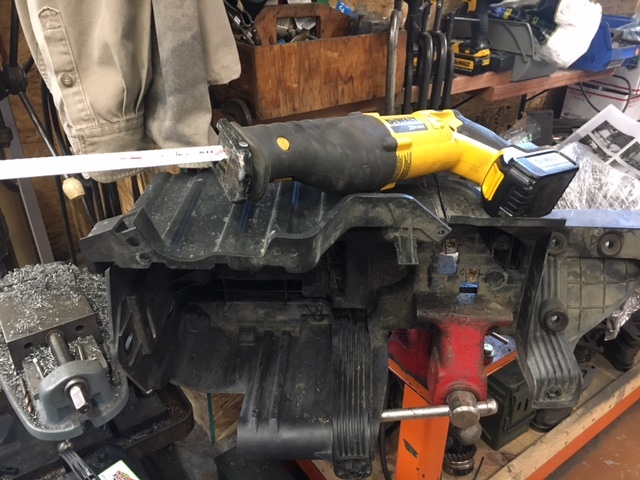 I personally like to wrench on jeeps and trucks in the fall, don't ask me why it's just how it seems to work out for me. Anyhow, I have a trip to MOAB coming up in a year from now and the next couple of upgrades are going to change this build drastically. So last week after consulting a certain knowledge base here on the board I pulled the trigger on this picture below. For now I'll let you all guess what is coming, it won't be hard to surmise I'm sure. Right after I pulled the trigger our dishwasher went out and its a crap spec home model so with that said now I have to go drop $700 or so on a good unit...... so good parts are on the back burner for a bit. sorry for not posting that sooner as this has been mounted for a few months now along with "real" read non ethanol 91 octane residing inside. What's you recommendation for the GJ of mine regarding tire size/rim? Tires are hammering, feels like bad bearings. I'd say they are at least 30% but the pounding is bad. I'd say you scooch the axles from Shawns trailer, put some 4.56's and 40's on it with a long travel coilover setup. Shoot, that's likely what Shawn plans to do with them though. I might be off on the gears and tires a bit, but hey it would fix the GJ also. That's what I figure is on the trailer anyhoot. 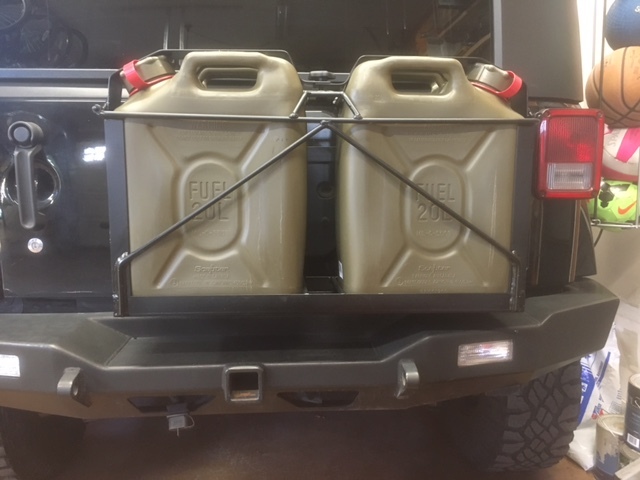 Gas can holder looks good too btw. Won't fit the 33" tires with those stock wheels, it's why I went to the aftermarket 16" wheels on mine with about a 3" back space wheel versus the 7" on stock ones (I might be exaggerating there a bit at 7"). But my tire size is currently 285/75 was just shy of a 33" tire and I had no lift. I put the lift on later too. I would rub a little turning & hitting the front suspension hard but nothing I couldn't live with. So if you want to keep those wheels stick to a 32" tire or less or buy a set of spidertrax wheel spacers. Edit x 2: when you say pounding do you mean the front end is hopping? Mine did that a little at 70 mph & above prior to installing the winch & winch mount plate. But it didn't hop near as bad as my rubicon 2 door tj used to. I don't like coilovers, I think I've stated this before but they have a limited amount of cycles before needing rebuilt. Great for a race truck that needs more wrench time than a mid 70's Harley. 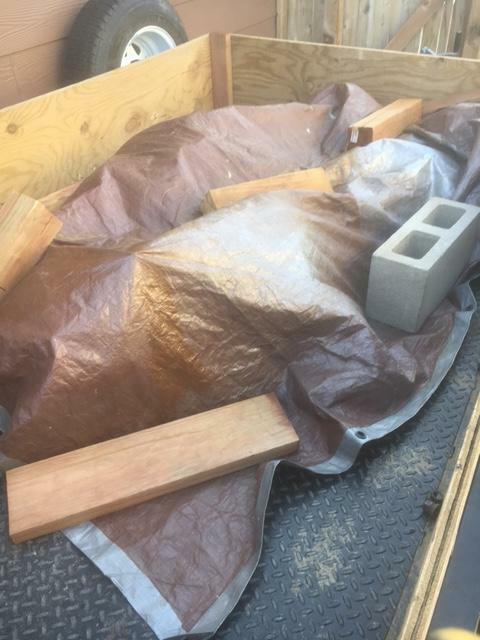 My guess as to what's on the trailer: A brick, several pieces of lumber (short length sections), and what looks to be a tarp. Amiright? Negative, other than using some oil this new motor is holding up. In the trailer is that a pair of Dana 60's or is the other one a 14 bolt?